LaTeX is a common format used for writing a Thesis or other academic document. It is particularly popular in the sciences and engineering topics. If you are writing any documents for publishing then use LaTeX. Once over the short learning curve it is much more productive than a word processor (such as Microsoft Word), especially for large documents. Plus, unlike a commercial word processor it is free, no more tie-ins to updates and subscriptions. Until now there was no easily available LaTeX template for a Coventry University (CU) thesis, other existing templates needed adapting. This article is a brief introduction to CULTT, the free Coventry University LaTeX Thesis Template. Whilst this article provides an overview to CULTT, there is more detailed information and useful links within the template itself. The end of this article also provides some useful links. The template is stored on a GitHub repository. It is provided as a zip file and a compiled PDF. Corrections and suggestions for changes are welcome, either via GitHub or email (dan@tekeye.uk). What are the Advantages of LaTeX? It is easier to concentrate on producing the written output and worry about the prettiness of the final document towards the end of the process. The content is not locked away in a proprietry format, e.g. doc or docx, allowing the content be easily accessed for other uses and publishing formats. Any text editing program can be used to write content, perfect for writing when on the move. The text based format makes it easy to use archiving and versioning tools, especially good for collabrative working. Online academic document authoring services provide useful tools to help manage workflow and content. Support for mathematical and scientific symbols is excellent. Bibliographies, references, and indexing are all supported and fully customisable. Can produce mutliple document types from the same content (PDF, Word Docs, HTML). It is free! No more paying for bloated and poorly designed word processing software. Taking the short time to get over the initial LaTeX learning curve is worth the effort. There is a productivity gain to be made compared to using a word processor. Use the many free tools based on LaTeX as an excellent way to write a long document and collabrate with supervisors and peers. Of course some will always prefer the instant feedback of a What You See Is What You Get (WYSIWYG) word processor. However, when writing for many technical conferences and journals a LaTeX template is often provided. Since LaTeX is well established in academia a LaTeX template for a Coventry University PhD should be available. That is the aim of this project. An existing thesis template was taken and modified. The University of Cambridge Engineering Department PhD/MPhil Thesis Template, a.k.a. CUED Template, fitted the bill as a starting point. This was copied and modified to remove the University of Cambridge specifics and add Coventry University requirements. Another change was to remove the copyrighted graphics examples in CUED. They were replaced with public domain images. The modified template is now suitable for writing up a Coventry University PhD. The full template is named Coventry University LaTeX Thesis Template, or just CULTT. Use the coventry-thesis.zip download, alternatively the source is available from a GitHub repository called coventry-thesis. The thesis template can be used on a personal computer or on an online LaTeX editing service, for example ShareLaTeX. The original Cambridge template contain some lengthy instructions on installing a working environment for LaTeX. For simplicity CULTT is just providing information on using the online editing tools provided by ShareLaTeX, and the Windows program MiKTeX. To use the template in ShareLaTeX select New Project and then Upload Project. Selected the CULTT zip file. The uploaded zip file creates a ShareLaTeX project called coventry-thesis. This can be renamed to something more suitable when in the ShareLaTeX projects list. 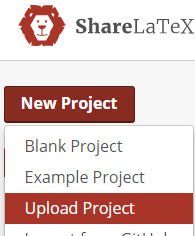 (Click on the up arrow icon in ShareLaTeX to return to the projects list, https://www.sharelatex.com/project). The template can be compiled into a PDF on ShareLaTeX. The starting template contains further information and examples of different types of text that may be required (e.g. figures, tables, and many more). The CULTT template has a sub folder for each section of text. You will need to delete all the demo text when writing your own thesis, however, if you want to keep the demo text either copy the project, or upload the zip file again. A straightforward program for editing LaTeX on a Windows PC is TeXworks, which is installed as part of a LaTeX environment using MiKTeX. This is also available from the Coventry University myLaunch software portal (if using a Coventry University PC). After installing MiKTeX, and if needed, create a shortcut on your Windows Desktop to MiKTeX program. The miktex-texworks.exe is found in the bin directory where MikTeX was installed. Then the CULTT zip file can then be extracted to a directory on the PC and the various files edited in TeXworks. The thesis is compiled into a PDF using the green run button. The top level file is thesis.tex. When this is compiled in ShareLaTeX or MiKTeX all the component files are pulled in to produce the final PDF. ShareLaTeX Documentation - Good for beginners. Mendeley - This reference manager integrates with ShareLaTeX.